Domestic fish can injure themselves inside a pond or tank, especially if the fish are acting aggressively toward one another. A damaged or fully removed scale may appear shiny, as the layer of skin underneath the scales can have a shiny or metallic appearance. Nevertheless, a discolored or misshapen spot on your fish may be a sign of disease. This is not always the case, however, and in some species, shiny spots are entirely natural. Shiny, metallic spots aren’t necessarily a cause for concern. In some species of fish, they are entirely normal. For example, betta fish are supposed to have shiny, metallic fin tips. If you are only just noticing these spots now, it could be that the fish is changing color and that the scales will be more iridescent during the change. Dropsy, a condition which may be caused by poor water quality or parasitic injection and is common in African cichlids and carp, can cause the scales to lift away from the skin or fall off completely, exposing the shiny, metallic skin underneath. This condition can be fatal and no medications exist to treat it, so a focus on prevention is essential. Carp pox can cause skin lesions on your fish that resemble droplets of molten wax. These lesions can grow quite large too. If your fish has what appears to be a spot, monitor its growth. These spots may grow into white, opalescent bumps. Ichthyophthirius, or “ich,” and less frequently “ick,” is a disease caused by a parasite of the same name. Unfortunately, once introduced into a domestic aquarium or pond, this parasite will thrive, as its young don’t have too far to travel to find a host of their own. Ich causes shiny white spots that grow into bumps, similar to carp pox. In severe cases, hosts will look as if they have been sprinkled with salt. lymphocystis is a virus affecting salt and freshwater fish. One of the first symptoms of this disease is a pebble-like spot on the skin. If these growths occur under pigmented areas of the skin, they may enhance the shiny or metallic nature of the skin. The spots will grow into a lesion not dissimilar in appearance to the shiny white bumps associated with ich. However, as the disease progresses, the lesion develops into a more wart-like growth. 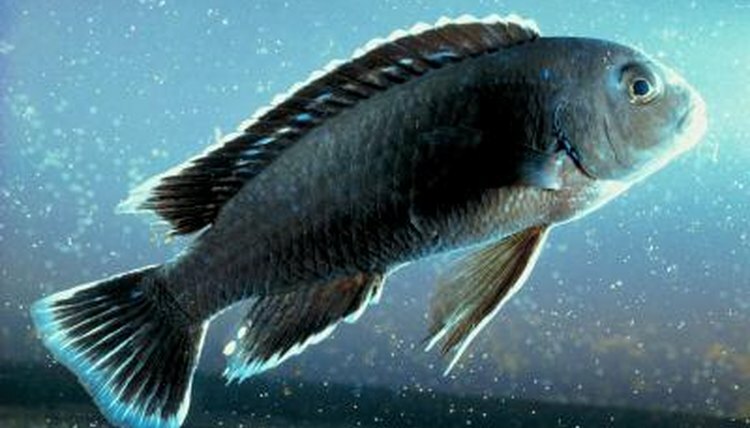 Why Do African Cichlids Rub Themselves on Rocks?